Ameyoko at night. Beware, most shops close by around 7. Ameya Yokocho is an area filled with exotic stores and markets that stretches southward from Ueno to the Okachimachi area. The area runs alongside the JR Yamanote Line and can be easily accessed from Okachimachi Station or Ueno Station. During the year’s end, the alley bustles with people seeking food for New Year’s. Ameya Yokocho(アメヤ横丁) literally means “candy store alley”, but many locals simply refer to it as Ameyoko(アメ横). During the Korean War, a large quantity of American supplies flowed into the alley from the US Forces presiding in Japan, giving birth to the term, America Yokocho(アメリカ横町, literally; American Alley). It is said that the term Ameyoko derives from the “Ame” from both “America” and “Ameya”. The area that is now Ameyoko used to be a housing district. During WWII, there was an electrical substation in the area for Japanese National Railways. Since the substation could have been a target for Allied air raids, the civillians in the area were forcefully evacuated to prevent casualties. The bombing did eventually come, but on a massive scale that flattened the whole area. The bombing would come to be known as the Tokyo Bombing. After WWII, the area became a bustling black market selling a myriad of goods. However, at the same time many gangs started to intervene and security in the area drastically fell. The local police realized this problem and asked a local entrepreneur named Kondo Hirokichi(近藤広吉) to build a market, which he did. The market housed around 80 stores and did not allow stores with any affiliation with gangs to come in. This led to the stabilization of the area and eventually, to today’s Ameya Yokocho. Ameyoko is home to many sporting goods stores, shoe stores and drug stores(薬局:yakkyoku). 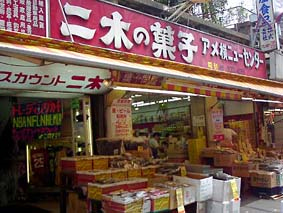 Niki no Kashi(二木の菓子) – store selling all kinds of snacks. It is a must-see if you are interested in Japanese Snacks. It’s not on the main alley so be sure to check out the address. Ameyoko Center Building – Underground this building are many Chinese and Southeast Asian stores selling exotic foods such as Shanghai crab and durians. It’s a little tricky to get there because of its rather unassuming staircase that goes underground. Tokyo Kutsu Ryutsu Senta(東京靴流通センター) – This is a shoe retailer that has several stores in Ameyoko. ABC Mart – This shoe retailer has many stores throughout central Tokyo. Yodobashi Camera Ueno(ヨドバシカメラ上野) – A store from the famous electronic chain store, Yodobashi Camera. It is located at the Ueno-side entrance of Ameyoko. 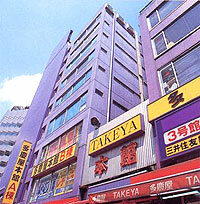 Takeya(多慶屋) – A huge discount store in an iconic purple building that can be accessed by a short walk from Okachimachi Station. Not exactly in Ameyoko but worth mentioning. 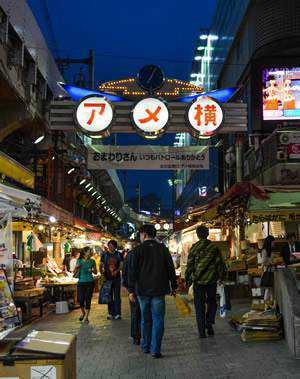 Ameyoko can easily be accessed from Ueno Station or Okachimachi Station. Although a little further to Ameyoko than Okachimachi Station, the stations, Naka-Okachimachi Station, Ueno-Okachimachi Station, and Ueno-Hirokoji Station are also within walking distance. These stations are connected via an underground passageway.